Integration solutions incorporate one or more elements of process, application, user interface, and information integration. Coping with the information explosion now requires information integration, a class of middleware which lets applications access data as though it were in a single database, whether or not it is. 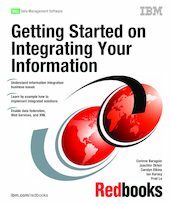 This IBM Redbooks publication shows, through examples, the various ways in which information integration can be implemented as a "pure play" or in conjunction with the other approaches for integration. Using IBM DB2 Universal Database V8.1, we describe how to start implementing several information integration scenarios based on DB2 UDB V8.1 to federate data from multiple sources such as message queues with DB2 and Informix databases using SQL; to access your information using a DB2 Web services solution; to store, compose, and manipulate XML data; and to populate a common data store. This book will help architects and implementers to understand the integration technologies in DB2 Universal Database and DB2 Information Integrator and to start implementing information integration solutions.